You can crochet a two-color version of the easy grid lace scarf pattern. 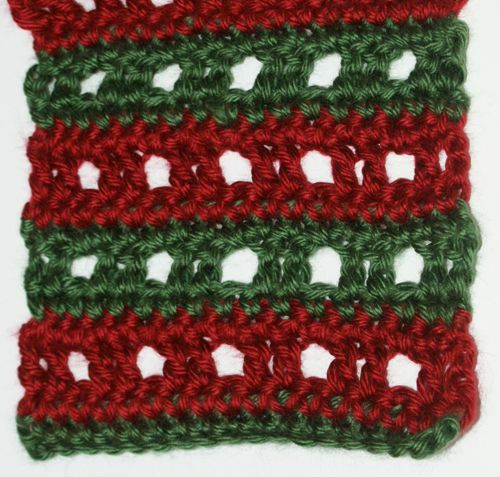 The sample scarf is crocheted in red and green, a combination that makes a pretty scarf for wearing during the Christmas and winter holiday season. You can choose any colors you like for crocheting your scarf. Think of team or school colors. Medium Weight Yarn: I crocheted the sample scarf using Caron's Simply Soft yarn in the "Autumn Red" and "Dark Sage" colors. Feel free to substitute any similar yarn if you like. Crochet Hook: I crocheted my sample scarf using a size I crochet hook. You can use this size hook if it enables you to comfortably achieve the correct gauge; otherwise, you'll want to change hooks and use whichever hook works better for you. Tapestry Needle: You'll need a tapestry needle for weaving in ends when you are finished crocheting the scarf. Finished Size: The scarf measures about 4.5 inches wide, and you can make yours as long as you want it to be. The sample scarf that is shown measures about 48 inches. Stitch Gauge: To check your stitch gauge, crochet 10 - 12 rows of the pattern and then measure the width of the scarf. Compare that measurement against my measurement of 4.5 inches. If your scarf is turning out the same width as mine, you've achieved the correct gauge; yay! keep crocheting. If not, you will need to decide whether you should adjust your hook size and start over. There are two compelling reasons you might want to start over. One: if the scarf is turning out to be a width that isn't wearable (for example, if it is laughably skinny, or unacceptably wide.) As long as you like the width, you don't need to feel compelled to start over because of that, even if the width is a little different than mine. Two: if your scarf looks like it's going to be significantly wider than mine, it means that you will use more yarn than I did when I crocheted my sample. In that case, it is possible that you could run out of yarn if you only purchased the amount of yarn specified in the pattern. If your scarf is turning out wider than my samples, you might want to consider beginning again with a smaller crochet hook. Row Gauge: For this particular pattern, row gauge is not important, because the length of the scarf is determined by the number of rows you crochet. You can crochet as many rows as you like to achieve your desired scarf length; you do not need to bother with trying to match my row gauge. Using color A ("Dark Sage" / green in my sample scarf,) ch 18. Row 2: ch 1, turn. sc in ea sc st across the row. Row 3: Ch 3, turn. skip the first st because your ch 3 will count as the first dc in this row and throughout the rest of the pattern. dc in next sc. [ch 1, skip next sc, work 1 dc in ea of the next 2 sc.] Rep the sequence in brackets across the row. Row 4: Ch 1, turn. Work this entire row in sc as follows: sc in 1st dc, sc in next dc, [sc in next ch-1 sp, sc in ea of the next 2 dc.] Rep sequence in brackets across the row.At the end of the row, change colors to color A. Row 5: ch 1, turn. sc in ea sc st across the row. Row 6: Ch 3, turn. skip the first st because your ch 3 will count as the first dc in this row and throughout the rest of the pattern. dc in next sc. [ch 1, skip next sc, work 1 dc in ea of the next 2 sc.] Rep the sequence in brackets across the row. Row 7: Ch 1, turn. Work this entire row in sc as follows: sc in 1st dc, sc in next dc, [sc in next ch-1 sp, sc in ea of the next 2 dc.] Rep sequence in brackets across the row. At the end of the row, change colors to color B.
Rep rows 2 through 7 over and over until your scarf is the length you want it to be. If you're not sure how long to make it, you may wish to take a peek at our readers' insights about the best size to make a scarf. End off, leaving enough yarn for you to weave in your ends. Thread your tapestry needle with this end of yarn and weave it into the scarf. Do the same for the other loose end(s). If you crocheted your scarf using wool or any fiber that responds well to blocking, you'll want to block it to accentuate the beauty of the lace pattern.